This week I signed up with Book-in-a-Week to force me to be accountable to others about writing on my WIP. Each writer sends a page-goal for the week, and then every night participants report how many pages they’ve written, culminating on Sunday night with the total pages for the week. Sometimes, without others saying, “How’s the writing going?” I can be quite lazy or find about anything else to write about or think about or do than work on my WIP. Even though I’ve not met any fellow BIWers face-to-face, it’s still a nice push to hold me accountable to produce something this week, or make me feel guilty if I didn’t reach my goal. Mind you, some writing days flow like warm, sweet honey, during which I can crank out 2,000 words in a day with no problems. And then there are other days (like today) when getting 250 words, or one page, completed is a struggle. It’s not like I’m stuck in a plot problem. It’s not like I don’t know where the novel is going or what’s going to happen. I just don’t wanna work on it. I suppose writing is a lot like dieting. Instead of losing pounds, you’re trying to gain word count. Dieters may put signs on refrigerators or keep written track of every single calorie intake. Writers also may put signs up, like sticky notes on computer screens or at the breakfast table. We can also record every single word written in one day to mark the progress. Whatever method works for you — having other writers give you a push, putting up reminders for, or anything else — just write! So quit reading this, and guess what you’re supposed to be doing now? A Writer’s Death. A Writer’s Vow. A writer friend died this past Sunday. It’s rare these days that writers actually meet face-to-face (except at conferences), as writing, out of necessity, tends to be such a solitary activity in our busy lives. But writers bond, no matter our differences. Deb and I were in the monthly Black Hill Writers Group 10-20 years ago. I moved to Michigan. Later, she moved to be with family in Indiana. We’d both left “the group,” but now we were only five hours near to each other! We often wrote of getting together. We never did. Deb and I didn’t write in the same genre, nor even for the same age group. We also had major differences of life opinion, but we still called each other “friend.” She, too, lived long enough to be a Grandma. She will be missed, both by her family and friends, and by the writing and reading community who knew her. Besides just the life and death thing — making the most of our time on this earth before we haven’t any more — I can’t express how old I feel at the moment. As my parents aged, they’d hear of friends dying, friends they’d always intended to get together with one more time. Too late. Now, for the first time in my life, I relate. I see The Lion King song “The Circle of Life” relates not just to births, but also to deaths. I write this post still numbed and raw from the news of Deb’s death, yet think for the millionth time wonder again why I am here and how can I best make use of my mortal life. As a Christian, I feel certain of my life after death. My death is not a worry for me. I’ll be sad for the sadness I’ll leave behind, but for me it’s merely a step from shadow through a doorway to clarity. My concern is more about what I do and say and think here in this time, in this body, on this earth. Unless we humans destroy each other, or a meteor puts a big bang into our planet, etc., I want to make my moments count. I’ll never be a great politician, nor famous for my work with poor or diseased or spiritually deprived, but I am a writer. I can’t stop school shootings, nor planes crashing, but I can write. And writing goes beyond the grave. This writer’s vow is not just to pound out word-counts, but each month to improve my craft so my words can relate smoothly to my readers. This writer’s vow is to maintain contact with and encourage other writers, both on-line and face-to-face. This writer’s vow is to be more observant of people and events around me and to deeply think about them so I can not only help, but someday perhaps write about them. 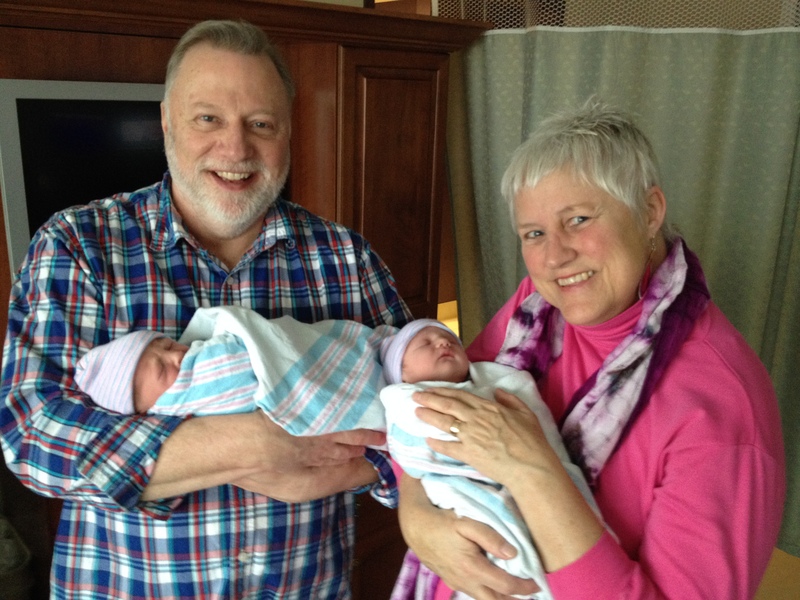 I’ve recently returned home from ten days of helping with twin newborn grandbabies and their three-year-old sister. What an honor to be there just the day they were born and able to help with the initial care of this beautiful, growing family. Also, getting to play with a pre-school-mind-sponge was tons of tiring fun. I was so prepared for this out-of-state adventure. I’d taken several books and finger-puppets for kiddo, and my new laptop, two books to read, and three notebooks for different projects for me, as well as all my state tax information, for I fully intended to do some writing and reading and related business in my spare time. When I wasn’t playing, changing diapers, cuddling criers, sweeping, mopping, washing dishes and clothes, reading picture books, giving baths, braiding hair, acting out nursery rhymes with finger-puppets, fixing meals, cleaning the kitty litter, finding appropriate 3-year-old programs to watch, etc., I was so tired I simply could not think; that is, think creatively enough to put words down onto paper (or computer). This brain-sucking reminds me of a man from church who had a heart attack. (Yes, this is relative to baby care.) When he was recovering at home, his wife asked him if he needed anything from the store. He answered, “Pampers.” They are in their 70’s. No babies needing Pampers in their house. So she pursued: “Why do we need Pampers?” “For the cat.” It took her a while to figure out he was searching for the words “kitty litter,” but the heart attack so affected his mind that finding the right word choice was difficult. Today at the grocery store the clerk asked me if I wanted paper or plastic bags. I stared at her open-mouthed as if answering that question was like trying to calculate the distance between Mars and Jupiter in meters. Medical conditions, emotional problems, or even the best of stress (like lapping up Grandma time) and being doggone tired does funny things to your mind and thought process and writing time. Can you write during these times? Or better yet, should you write during these times? 3) Take a deep breath and give yourself a temporary guilt-free writing pass. Ah. Writing. There are so many ideas, so many characters, so much internal and external conflict to wrestle with. I love getting my thoughts down onto paper or up onto computer screen (and drives). It feels wonderful to accomplish such a feat with so many other non-writing-related activities pressing in all around. Wouldn’t it just be grand if writing was all there was to a writer’s life? Of course, there’s the mental struggling with plot and character, and the writing it all down (or typing it). Writing is a very romantic career, and I don’t limit that to genre. There’s so much more. There is research, and revisions, and critique groups, and more revisions, and more research. There’s setting the story aside to decide later it needs a full rewrite. And checking your story word for word for silly little errors. Then you must search what to do with your completed story — agent, editor, self-publish, alternate, or trash it. When your story is published, of course, you go on to writing your next story. That’s a given. While that happens, you also must coddle your already published toddler. What does this coddling entail? Updating your website, being “visible” on social media sites, printing business cards for live encounters. There are book signings, speaking engagements, and follow-up, including evaluations, to all. To each of these coddling suggestions, I could write chapters. My mantra has always been that family comes first. That said, it’s often difficult to find time to write when you have babies to care for, toddlers, work which pays bills, school activities, church activities, social activities, house, yard, etc. Surely, there are at least 33 hours in any given day, right? And who needs sleep? Yet, somehow, the writing bug wiggles deeply into people who work and have families and family activities. Family always comes first, which means sometimes writing must be put on hold. Writing demands discipline. You can finish stories one sentence at a time, or as Anne Lamott puts it, bird by bird–writing during your children’s nap times, and then compartmentalize it while you focus on other aspects of life, like your kids. Is there no end to what an author today must do? The short answer is no. So prioritize your time and what needs to be done. Focus. Be a disciplined person. Write. Market and promote. But most of all, hug and spend time with your loved ones.